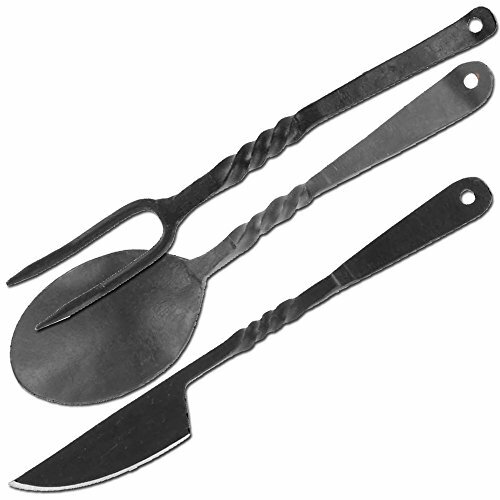 Hand forged from steel and given a blackened antique finish for an authentic look, this cutlery set includes a knife, fork and spoon to give you everything you need for a taste of authentic medieval camp life. These three utensils feature a little elegant twist design in their grip, adding a fine touch of detail to their design. The knife has a short drop point blade with a curved edge and a fine point, a curled over handle provides a wider grip. The fork features two tines, like the traditional carving fork, and these utensils have a hole in the end to hang on a hook to store away when they are not in use. Please Note: Bowl is not included.